Very nice sailor bank made by McCoy for Seaman’s Savings Bank! It is in super condition – the original metal stopper is missing and there is a teeny production pin-pop under his nose (it is production and is not detracting). Great addition to a collection! Excellent condition McCoy bank produced for Bowery Savings Bank! 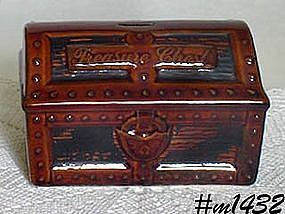 Shaped like a money chest, the bank is a replica of the first money chest of 1834 and is so noted on bottom of bank. Measures 6 1/8” long, 3 ¾” wide, and 3” tall. It is in wonderful condition – even has the original metal “stopper”. Super item that is becoming more and more difficult to find! 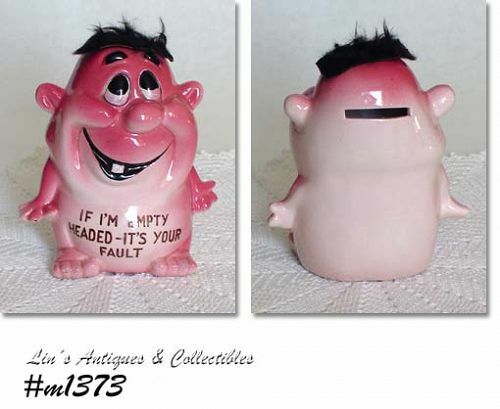 This is a cute Frankoma item – it’s a piggy bank! Piggy has a basket on his back and he’s either lazy or the basket is “heavy” because he’s sitting on his hiney. Bank measures 4 ¼” tall (at tallest), 6” long (at longest), 3 ¼” wide (at widest) and is a pretty yellow color with shiny glaze. Bank has the original rubber stopper and is in mint condition! 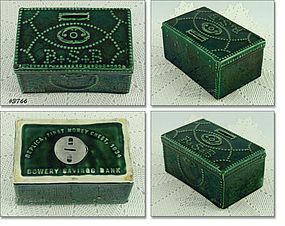 This is a super bank and a great collectible! It’s a Kreiss look-alike bank and it really is – the color and color shadings are excellent! 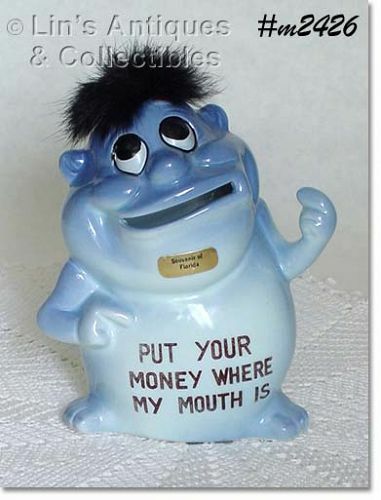 This is the “Put Your Money Where My Mouth Is” bank, he’s blue with black “hair” and is in excellent condition. Has a small “souvenir of Florida” sticker on front. Even though this is a Kreiss look-alike, it’s very collectible in its’ own right and is listed in the 1999 Kreiss reference book with a value of $80! Neat item. 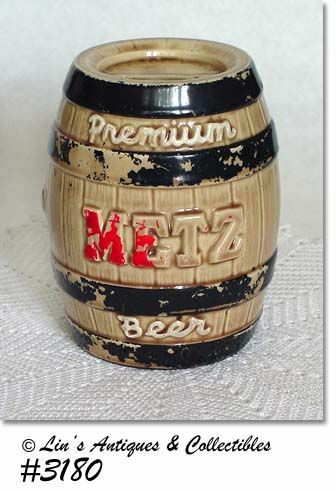 Made by McCoy for Metz Brewing Company, this is a neat bank! It’s in wonderful condition – has no chips or cracks but has lost approximately 20% of the original cold paint and has lost its stopper. Neat item, difficult to find! 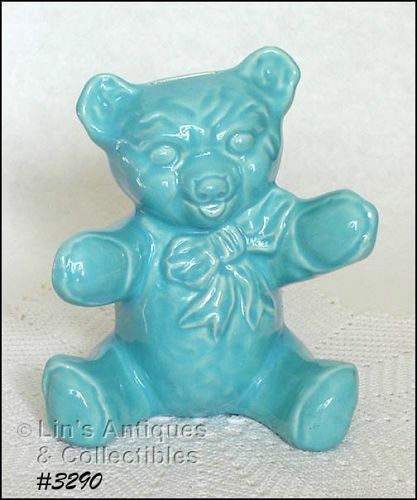 Thank you for visiting Lin's Antiques at Cyberattic! This is an adorable bank! 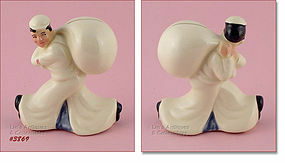 Made by American Bisque, bank is shaped like a snowman’s head and he’s nattily attired with top hat, earmuffs, and a bow tie. 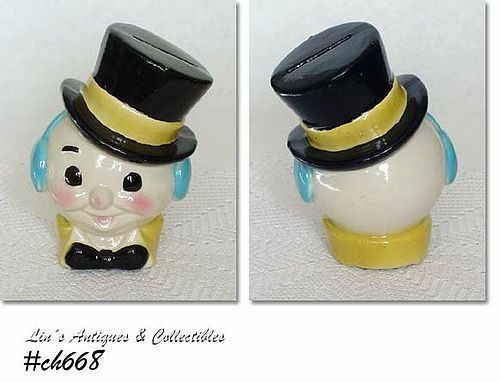 Measures 6 7/8” tall (at tallest) and is in wonderful condition – feels like he has had minor color touch-ups on his hat and he doesn’t have a stopper – that’s it! Very nice collectible. 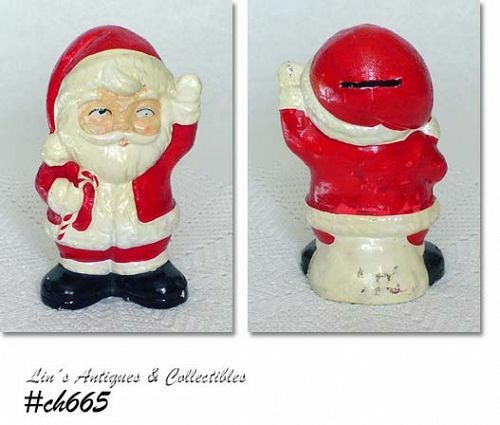 This is a cute, older Santa bank! Measures 5 ¾” tall and has a red with gold “made in Japan’ sticker on bottom. He is papier-mache’ and is in very good condition with some flecks of missing color (could be easily touched up). Isn’t this an ugly cutie! 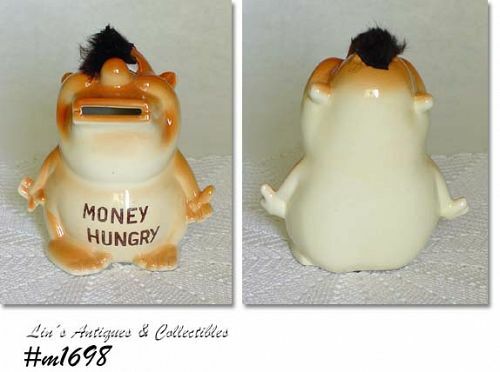 This is the “Money Hungry” bank with “hair” – a Kreiss look-a-like. Measures 5 ½” tall and has no chips or cracks! Per reference book dated 1999, this bank is valued at $70 – we found at a nice price and are happy to share! Neat collectible, not your everyday find. Very nice unmarked McCoy bank! 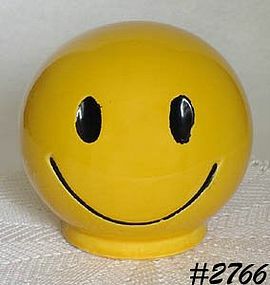 This is the smiley face bank in the cheerful golden yellow color with black cold painted eyes and smile. Bank is in wonderful condition with no chips, cracks, or crazing! Has lost the stopper and some of the cold paint (could be easily touched up if you choose). 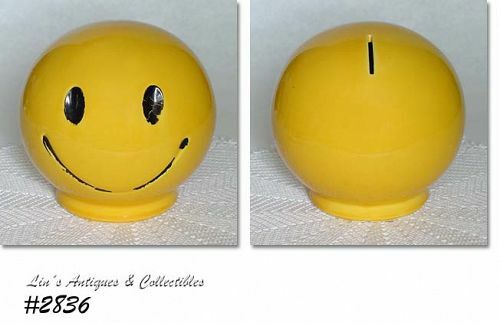 CUTE MCCOY BANK -- A SMILE FACE! HE'S ROUND AND IS THE PRETTY DARKER YELLOW COLOR WITH BLACK EYES AND MOUTH. MARKED ON BOTTOM: USA. IN EXCELLENT CONDITION -- HAS A COUPLE TINY (1/8", 1/16") DINGS ON BOTTOM, NO CRACKS, NO CRAZING -- HAS LOST A LITTLE OF HIS BLACK PAINT AND DOESN'T HAVE A STOPPER (HOLE WAS COVERED WITH MASKING TAPE WHEN I PURCHASED). VERY NICE ITEM! CUTE BANK SHAPED LIKE A PIRATE'S TREASURE CHEST! IT'S IN A WARM BROWN COLOR WITH BLACK COLD PAINT "ANTIQUING" EFFECTS. MEASURES 6 3/8" LONG, 4 1/4" WIDE, 4 1/4" TALL. MARKED ON BOTTOM: 2203, MADE IN USA. ALSO HAS MANUFACTURER'S NAME, HEAVILY GLAZED BUT APPEARS TO BE TERRACE CERAMICS. BANK IS IN WONDERFUL CONDITION WITH A COUPLE "NIBBLES" AT THE COIN SLOT. NICE ITEM! 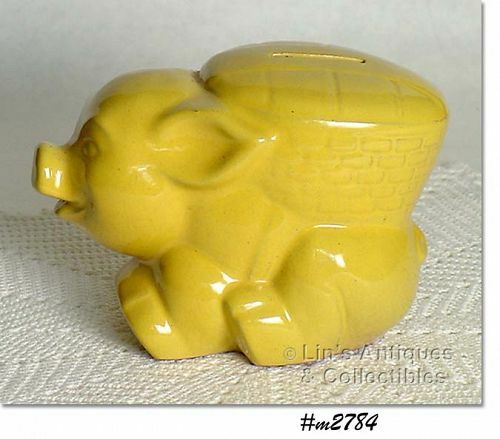 CUTE CERAMIC BANK! HE'S IN SHADES OF PINK, HAS A GOOFY FACIAL EXPRESSION, AND BLACK "FAUX" HAIR. ACROSS HIS TUMMY, "IF I'M EMPTY HEADED -- IT'S YOUR FAULT". IN VERY GOOD CONDITION -- MISSING STOPPER AND HAS A COUPLE TEENY DINGS ON TOES -- OF NO CONSEQUENCE! NEAT COLLECTIBLE, CAN BE SEEN IN "THE WORLD OF KREISS CERAMICS" BY PAT AND LARRY AIKENS WITH A 1999 LISTED VALUE OF $65.00! SUPER NICE MCCOY EAGLE BANK! 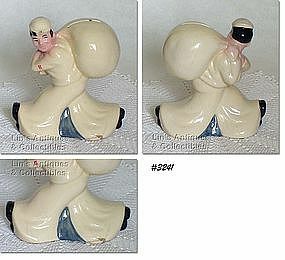 PRODUCED FOR EMIGRANT INDUSTRIAL SAVINGS BANK, MEASURES 7 3/8" TALL. IN EXCELLENT CONDITION -- NO CHIPS, NO CRACKS, NO CRAZING -- HAS LOST ITS ORIGINAL STOPPER -- THAT'S IT! HAS A LINE ALONG HIS NECK (ON FRONT) THAT IS A PRODUCTION LINE OF POTTERY -- NOT A STRESS OR DAMAGE OF ANY KIND -- I CHECKED WITH A MAGNIFYING GLASS. SUPER ITEM! 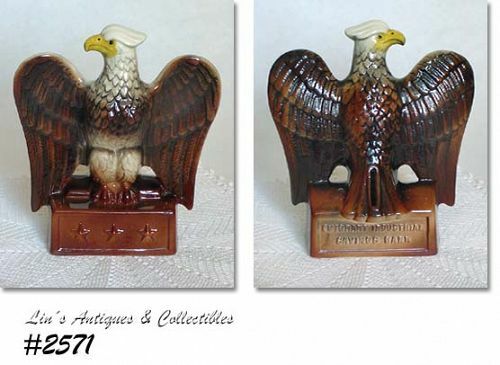 Beautiful colors and excellent mold detail on this American Bisque coin bank! 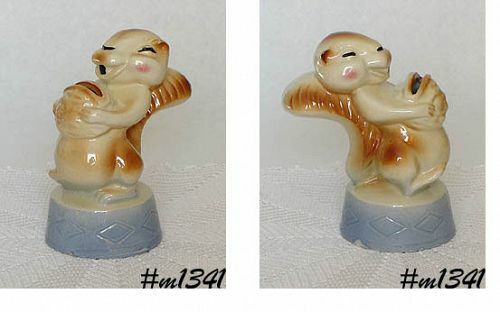 It's shaped like a squirrel standing on a drum! Bank measures 6 1/8" all (at tallest). 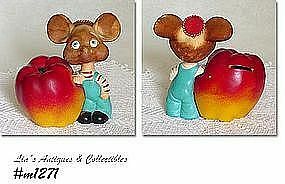 REALLY CUTE VINTAGE TOPO GIGIO BOBBLE HEAD WITH APPLE BANK FROM THE 1960s! MOUSE MEASURES 5 1/2" TALL (AT TALLEST), APPLE MEASURES 3". HAS PAPER FOIL LABEL -- ROSSINI, JAPAN. NEAT ITEM! 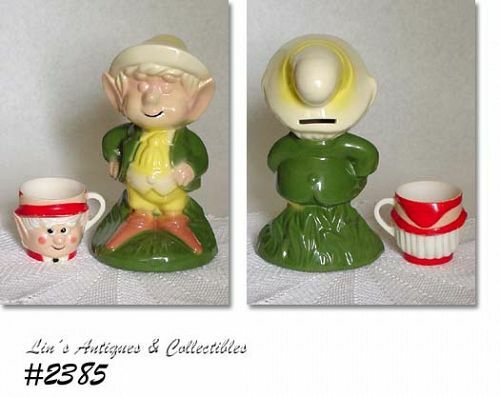 This listing has an unmarked Keebler Elf bank made by McCoy!